Extreme late post, but for my birthday this year, S took me to Sushi Bar Maumi for dinner. 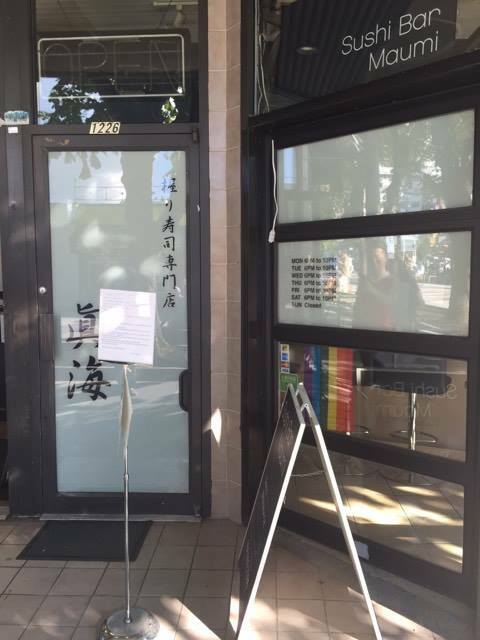 They are known for their fresh fish which is imported daily from Japan and what most believe is as authentic of a sushi bar in Japan as you can get in Vancouver. The restaurant seats only 10 people each time slot and you must reserve the specific time slot in advance. Because the restaurant is only run by the chef and one waitress, they only take reservations from 3-5:30pm. 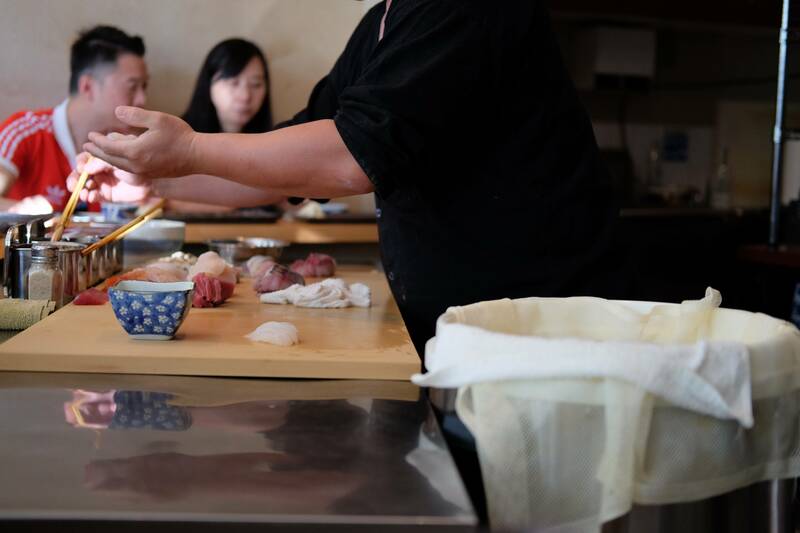 In fact, S said they were extremely strict on the phone stating that they don’t serve any alcohol, that you must order from their omakase menu, and that you better arrive a bit early because latecomers will be frowned upon. They only have 3 seatings: at 6pm, 7:30pm and 9pm. Because the restaurant is very small and intimate, I tried to avoid taking too many interior pictures. Essentially, the chef stands in the middle and the seats form a half circle around him. Apparently, this is very different from what it was like a year ago, when you could order off the omakase menu. Now, the nigiris are served one piece at a time. However, we were surprised that all the fish is cut in advance. I guess this saves time so that the service can be done as quick as possible. At the same time, some may find this is not as authentic as what you would experience in Japan. However, for the price point compared to the ones in Japan, I can’t complain. Other than sushi, they do feature some soups and appetizers. 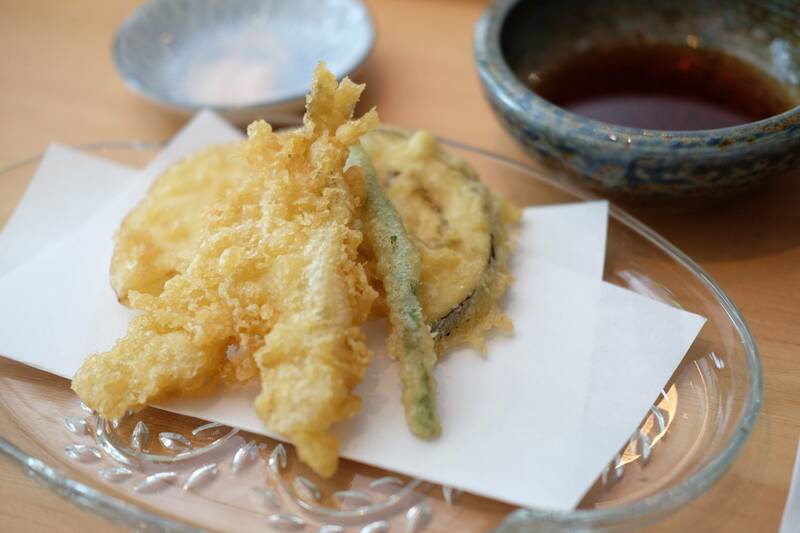 We decided to try the Fresh Kisu Tempura, which comes with one silver whiting and three pieces of assorted vegetables. The batter wasn’t too thick but I thought this was quite expensive given how little and thin the vegetables were sliced. 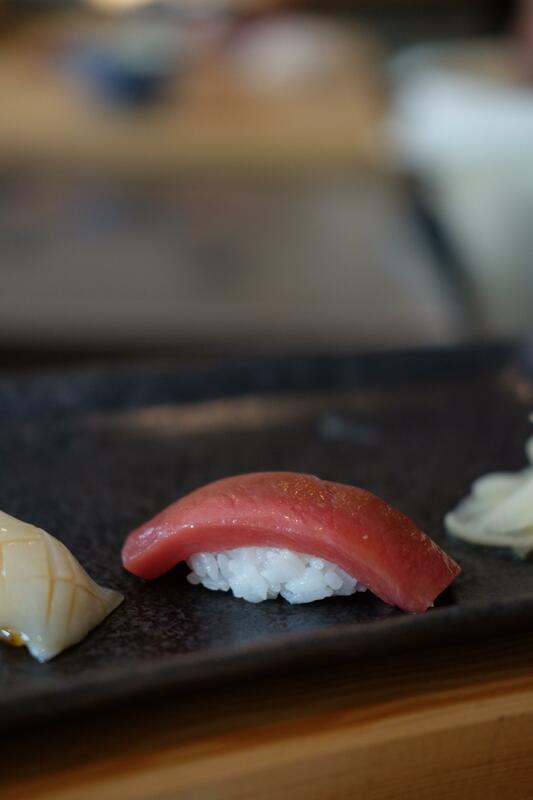 I would skip this next time and focus on the nigiri. When we visited, there were only two omakase menus to choose from. 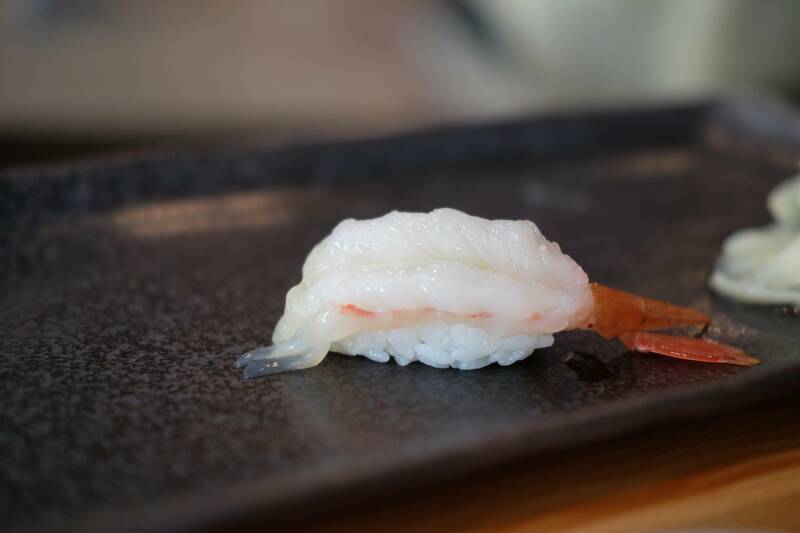 A 10 piece nigiri omakase for $45 and a 12 piece nigiri omakase for $60. The difference is that the more expensive menu comes with Bluefin tuna and Bafun Uni from Hokkaido. We decided to go for the latter to get the best experience. 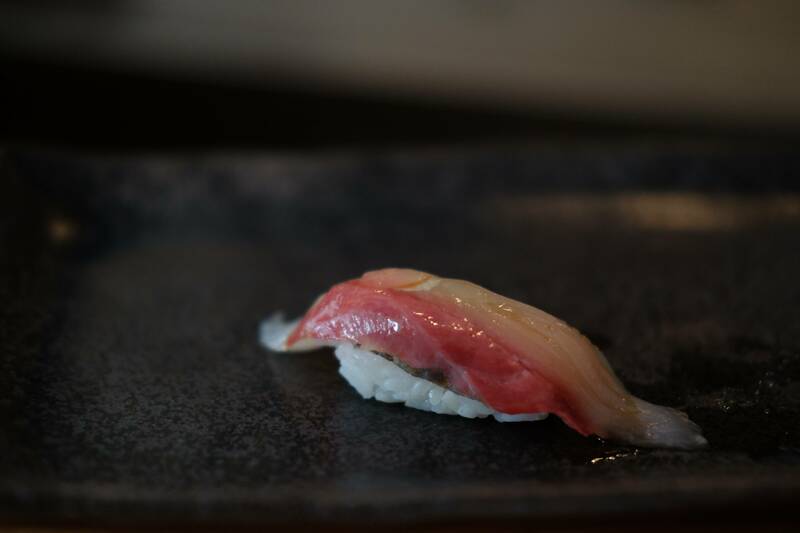 The fish change daily depending on what the chef believes is fresh, so you may get different items from what I experienced. In addition, the chef will ask you if you want wasabi inside or not. In Japan, most restaurants would have wasabi inside already, but I guess they are catering to the clientele in Vancouver. Our first item was the Flounder. I loved this as it was oily and melted in my mouth. 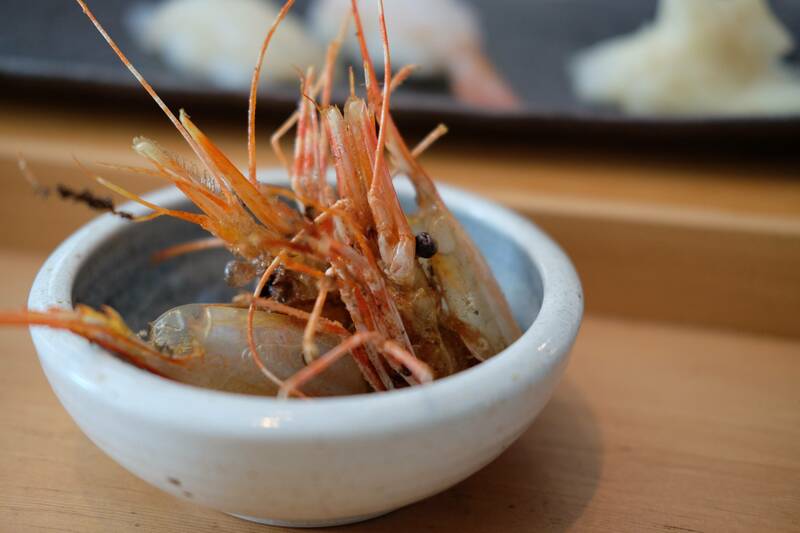 Next was the Amaebi (spotted prawn). I usually don’t like this as I find it quite slimy, and if not fresh, it can have a weird aftertaste. However, this was extremely fresh and sweet. In Japan, they don’t waste any of their ingredients. This meant that the heads of the prawns were lightly fried. We looked around and everyone was eating the whole thing, so we did the same! I guess it’s like soft shell crab, but I honestly wasn’t very used to eating the shell. Next up was the Flying Squid, which was lightly brushed with soy sauce. 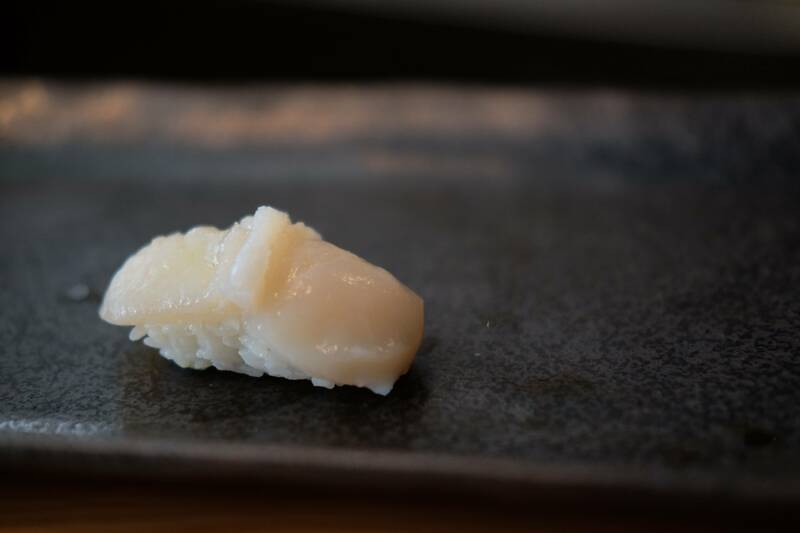 I’m not usually a fan of squid for sushi because it can be too chewy sometimes, but this was actually very tender. Because we paid for the more expensive option, our menu included the Bluefin Tuna. This was seriously the best part of my meal. The tuna literally melted in my mouth! I highly recommend trying this, but don’t eat too much since this type of tuna has been overfished! 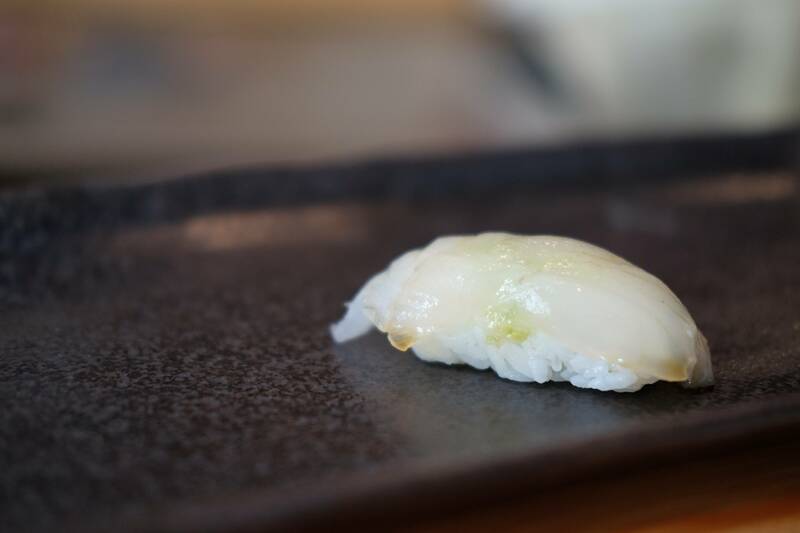 Onto another favourite and must order of mine at all sushi restaurants is the Scallop nigiri. I love a good fresh scallop, and this was perfect with a subtle sweetness of the sea. Apparently, this is fresh from Hokkaido. I love it paired with the wasabi underneath. An unfamiliar fish to me was the Japanese Amberjack. To be honest, I am not very adventurous with my sashimi and usually stick to the typical tuna, salmon, and scallops. I was suprised that the Japanese Amberjack was more of a deep red as I always thought it was more of light pink flesh colour. However, paired with the light soy sauce, it was delicious. I’m usually not a fan of Japanese Horse Mackarel because I find that it can be quite fishy sometimes. However, this was very fresh and along with the ginger and green onion, it complemented the fish very well. 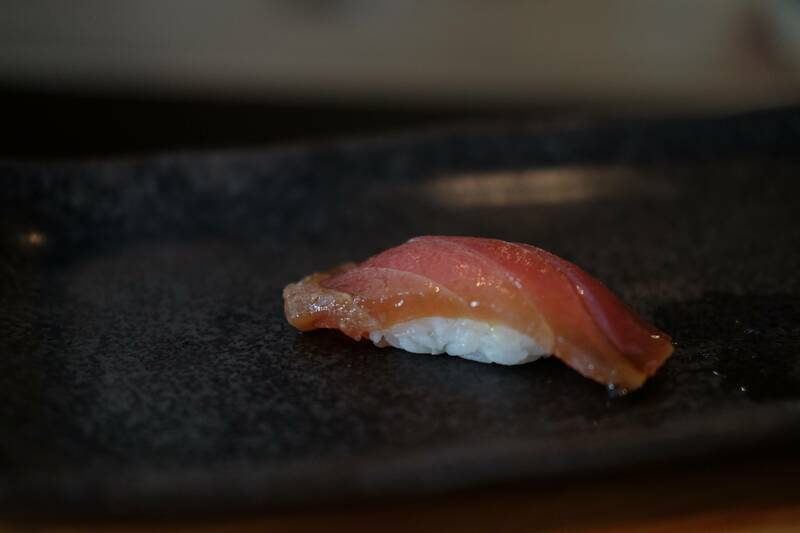 Another favourite of mine was the Big Eye Tuna which is a cut from the red tuna. It was brushed with soy sauce so it was glistening! This is not the melt in your mouth type of cut, but I actually really enjoyed it. You get more texture from this. I’ve never had Kanpachi, so this surprised me. It was very fatty and high in oil content and therefore melted in my mouth. So creamy! I love Uni! Not something for everyone because S tried it for her first time and absolutely hated it. I can see why as it does have a strong sea flavour and can taste funny for first-timers. However, I loved how it was paired with wasabi to bring the sea flavour out. 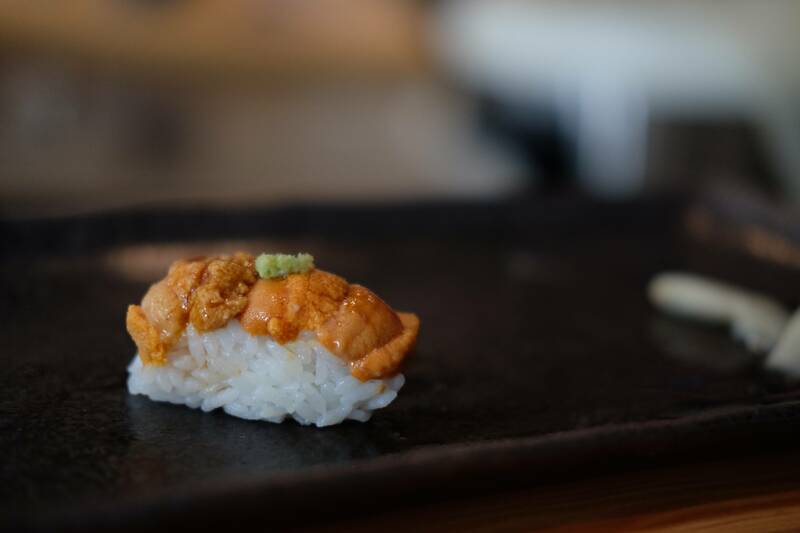 The bafun uni comes from Hokkaido which is the most prized due to the kelp and clean water that they feed on. Absolutely delicious! 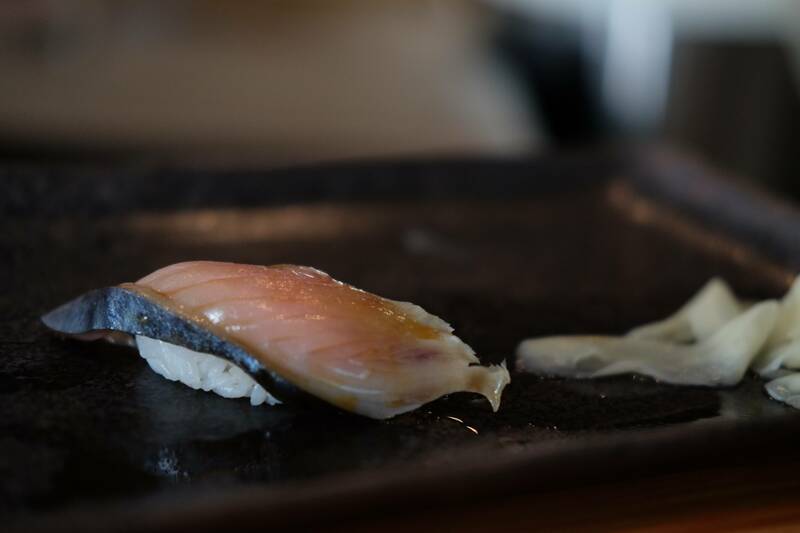 Similar to the aji, the Saba came without the garnishes and was also not as tender. It was meatier and had more of a chew. 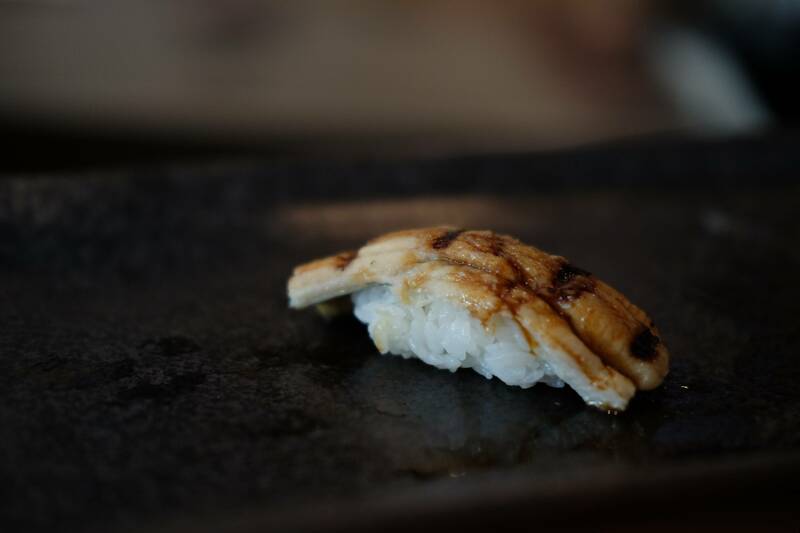 To finish our omakase, we had the Saltwater Eel, which had a more delicate texture than your typical unagi. 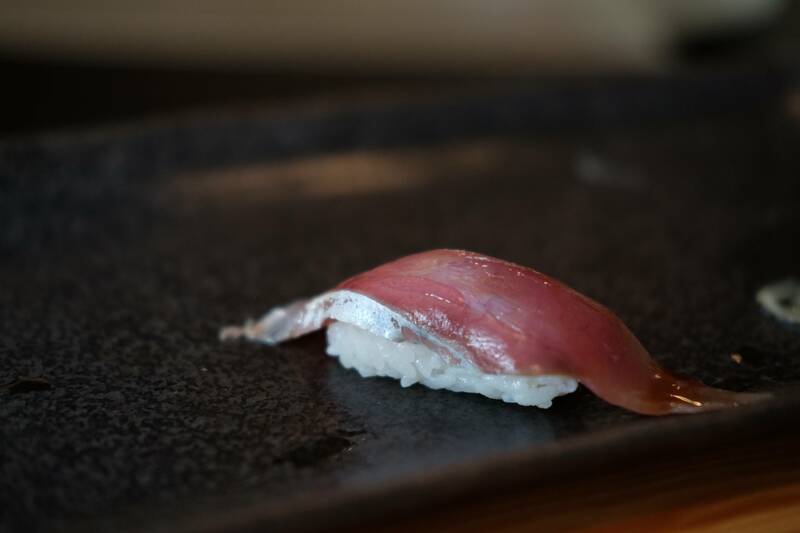 It was my first time trying this, and although I usually dislike unagi, I fell in love with anago! The chef torched the eel slightly and therefore the eel just melted in my mouth! A great way to end the meal! 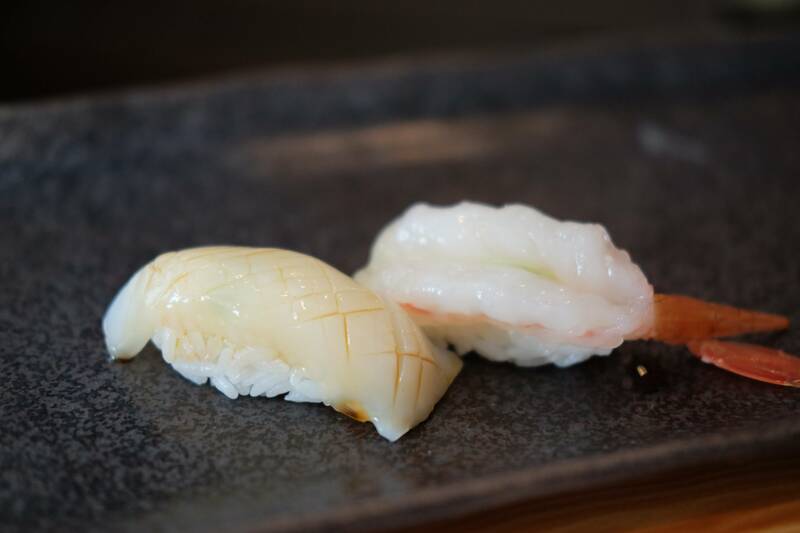 Overall, S and I were very impressed with the quality of sushi at Sushi Bar Maumi. I definitely cannot afford to come here all the time, but it is a nice treat once in a while if you want to experience what a Japanese omakase would be like. Keep in mind that there is a time limit, so it’s not a place to stay long and chat after and your conversations should be kept quiet. Also, after your omakase, they present you with a menu with all the nigiris you can order (many of which are not on the omakase). 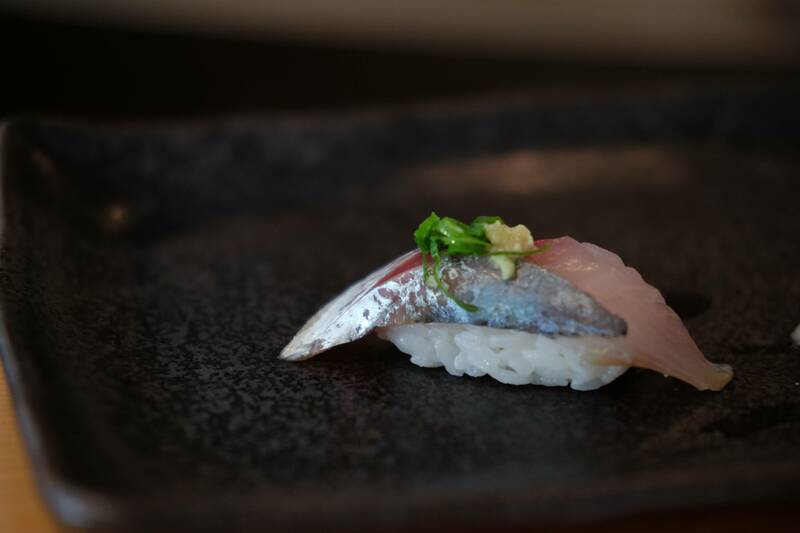 Each piece is quite expensive but you can try many fish that you might not be able to find elsewhere. – Wished we could watch the chef cut the fish in front of us! I thought blue fin and albacore were 2 different types of tuna? Thanks for catching that David! I must’ve been day dreaming writing this… Haha I will update it 🙂 You can get the real experience in Japan when you go! !